In what has turned out to be a contentious, chaotic, and disorganized Democratic National Convention, not even our own governor could escape the chasm between the establishment of the Democratic Party, which recognizes the necessity of fracking, and the radical left grassroots, which wants everyone to wear organic fibers and walk to Philadelphia (we assume that’s how the fractivists arrived). In a panel discussion event that focused on energy, a protester from Colorado walked past security right up on the stage to confront Hickenlooper face to face. The Denver Post also reported that just before the confrontation, a different protester jumped up in the crowd, opened a banner, and proclaimed “I hold you personally responsible for poisoning America.” It appears that this disruption allowed the man who confronted Hickenlooper to get on the stage without being stopped. At the end of the panel discussion, protestors shouted at Hickenlooper for supporting fracking. 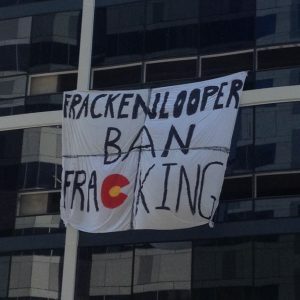 Hickenlooper was also greeted with a large sign made from a sheet hanging from a building across from the event that read “Hickenlooper Ban Fracking,” with the C in fracking in the style of the Colorado state flag.